NYC, 04/17/2019, 6:30PM. Born To Be Posthumous: The Eccentric Life and Mysterious Genius of Edward Gorey. From The Gashlycrumb Tinies to The Doubtful Guest, Edward Gorey’s sly, silly, and sinister books have influenced generations of artists and writers. A deeply complicated and conflicted individual, Gorey was a man whose art reflected his obsessions with the disquieting and the darkly hilarious. 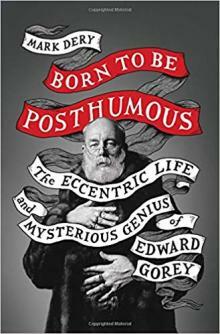 In Born to Be Posthumous: The Eccentric Life and Mysterious Genius of Edward Gorey, Mark Dery pulls back the shroud on the eccentric genius and his mysterious life, through newly unconvered correspondence and interviews with luminaries such as John Ashbery, Lemony Snicket, Neil Gaiman, and Anna Sui. Dery, a cultural critic and essayist, will be joined in conversation by Jennifer Szalai, book critic for The New York Times.